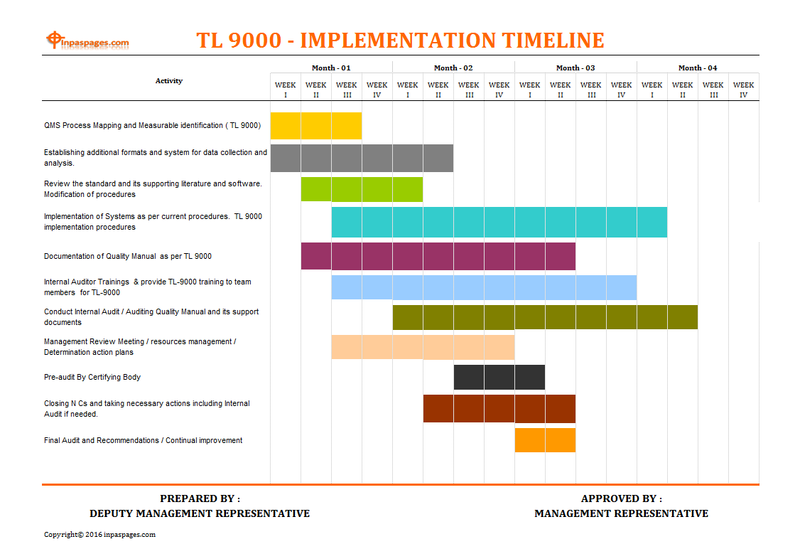 How to implement TL 9000 in an organisation? The TL 9000 is management system standards for quality defined specifically for telecommunication industry. The TL 9000 is quality management system standards defined, specifically for telecommunications industry. The standardizes the management system requirements for various levels, and various processes. That including product design and development, product installation & services, maintenance activities etc. This system are designed for telecommunication products and its related services. Its is also manage to improvement of existing system. Progress and implementation by conducting specific defined performance metrics. Its concern requirements to overall implementation of organization. The TL 9000 is based on quality management system that if needs to implement TL 9000 in organization. That needs to manage primary or base levels of quality management system in internal system. The quality system requirements of the telecommunications product manufacturing industry. Services provides should be maintain and implement accordingly. The system will be applicable to all the “chain” that organization under implementation. The supplier quality implementation, monitoring and auditing should be conducted. That is vendor development according to TL 9000 should be considered in the activities. First Stage: At this stage require to follows which are basic steps that help to implementation. The implementation stages are maintained through it. The management should conducted the basic requirements. That is TL 9000 implementation requirements to quality management system process mapping and measurable identification of TL 9000. Second Stage: The second stage is to establishment of additional formats & system for data collection analysis documentation to improvement of system. The analysis records and reviews of the standards and its concern literature / software and the related procedures are needs to conducted. Third Stage: The third stage of the implementation of system by prepared and verifies the procedures, work instructions, guidelines and documents helps to modifications and implementation procedures in regular tasks. The basic documentations of quality requirements as per quality system, and its reference documents should have maintained. The steps for the training to team members, internal auditors training and awareness to all the employee is necessary according to procedure, and same the conduct internal audit / auditing quality management system and its supporting documentations. The management is responsible for conducting reviews to arranging management review meeting, resources management and determines action plans of results of management reviews meeting in organization. Any system in the organization is best ways to improve and enhance existing system. Also important that the system is being sustain, peoples should accept and implement it self for improve system.